Peter Andre will reportedly get £1.5 million to write a family cookbook. The singer, who recently split from wife Katie Price, is writing a single man's guide to feeding the family with easy-to-prepare recipes, reports the Daily Mirror. A source told the paper: "This will really drive Katie round the bend - Pete's empire just keeps on growing. Kate prized herself on having best-selling books, it was one of the things that made her more of a housewife than a party girl. "But now Pete is riding high and more and more success is coming his way since the split." The release of Peter's book could lead to a chart battle with Katie's beauty tip book - Standing Out - which is due out later this year. 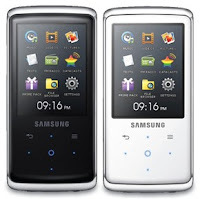 Listen to all of your favourite Peter Andre hits on one of these Samsung YP Q2 8GB MP3 Players available in a choice of two colours. Only £79.99.